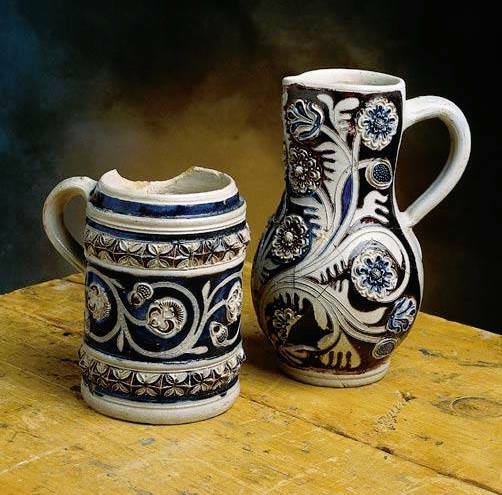 Among the most characteristic stoneware forms to have been found in colonial North America, the jug at right was broken in the early eighteenth century and found at the site of the Jérémie House near Québec's Place-Royale. 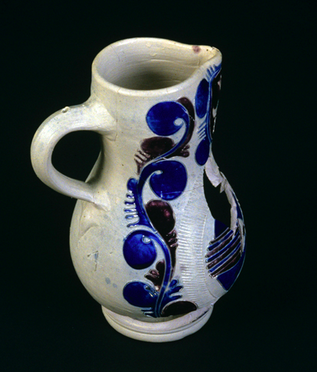 The form is commonly referred to as a "Bartmann" jug after the sprig-molded bearded figure commonly seen adorning the neck. Such jugs were commonly used to store beer and wine and exported in large quantities from Frechen, southwest of Cologne. A non-porous earthenware, stoneware was used by all social groups and largely imported from Germanic states along the Rhine River. Although a glaze is not a necessity like it is for faïence, many stoneware ceramics were fired with a salt glaze that creates a glossy, translucent surface with a slight mottled texture similar to citrus peels. Various oxides, in particular cobalt and iron, colored clay slips were employed to add color to stoneware vessels, as seen in the two pieces at left recovered from a home on Québec's Place-Royale. Designs might be further delineated through the use of different molds, including sprig and press molds.